What are seeds, peers and leechers in Torrents' language? Explanatory What are seeds, peers and leechers in Torrents’ language? If you are a Torrent user, you must have seen the terms “Seeds”, Peers and “Leechers” while downloading torrents. We generally look at the corresponding numbers against them and download them. But have you ever wondered in technicality what do they actually mean and how are they related to torrents? To understand this, you should first know what is a “BitTorrent’? BitTorrent is a communications protocol of peer-to-peer file sharing (“P2P“)*** which is used to distribute large amounts of data and electronic files over the Internet, such as digital video files containing TV shows or video clips or digital audio files containing songs. ***Peer-to-peer (P2P) network is created when two or more PCs are connected and share resources without going through a separate server computer. A P2P network can be an ad-hoc connection—a couple of computers connected via a Universal Serial Bus to transfer files. The BitTorrent protocol can be used to reduce the server and network impact of distributing large files. 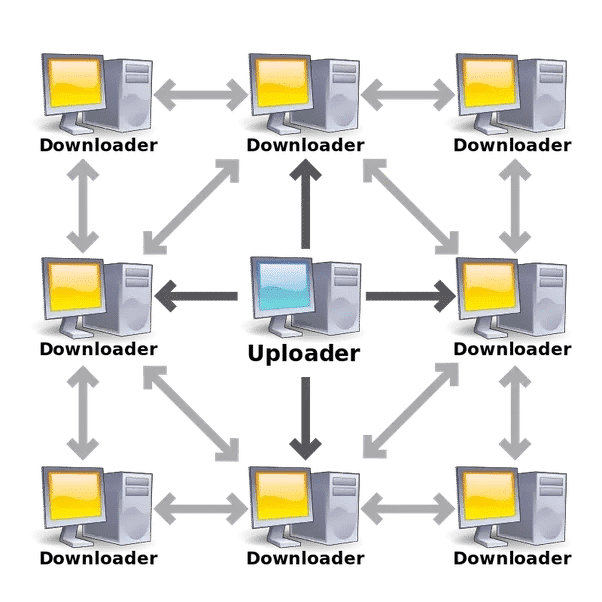 Rather than downloading a file from a single source server, the BitTorrent protocol allows users to join a “swarm” (a group of people downloading and uploading the same file) of hosts to download and upload from each other at the same time. Using the BitTorrent protocol, several basic computers, such as home computers, can replace large servers while efficiently distributing files to many recipients. This lower bandwidth usage also helps prevent large spikes in internet traffic in a given area, keeping internet speeds higher for all users in general, regardless of whether or not they use the BitTorrent protocol. Let’s now understand the meaning of the common BitTorrent terms. What are seeds, peers, and leechers in torrent? Seed is a person who has a torrent file open in their client (let’s say the same file you are trying to download) and the only difference between you and them is that they have the complete file downloaded already and are now “seeding” – sharing the file with peers but not downloading any parts of the file from others. Leechers are those who are downloading and uploading at the same time. If a user starts sharing a file that he already has, and downloads what other users have already uploaded or are in the process of uploading a torrent file, he becomes a leecher. The process of uploading and downloading continues simultaneously. In fact, a leecher tends to download files that are not present in the system resources and starts sharing what already is present in its repository or database. Generally, the more people who seed a file the faster it downloads. When the file of the leechers downloads 100% and still they don’t remove it from uploading, then they become seeds. In the image above, the middle computer is acting as a seed to provide a file to the other computers which act as peers. A Peer is someone who is both downloading and uploading the file in the swarm. Files are downloaded in pieces. When a user downloads some pieces, he then automatically starts uploading it. A file will be downloaded faster if more people are involved in the swarm. A peer becomes a seed when he has completed 100% of the file and wishes to continue uploading. A user who wants to upload a file first creates a small torrent descriptor file that they distribute by conventional means (web, email, etc.). They then make the file itself available through a BitTorrent node acting as a seed. Those with the torrent descriptor file can give it to their own BitTorrent nodes which, acting as peers or leechers, download it by connecting to the seed and/or other peers. When a file is completely downloaded by a peer, it becomes an additional seed. This ultimate shift from peers to seeders defines the overall “health” of the file (as determined by the number of times a file is available in its complete form). Great article, but the explanation about the leechers seems confusing. Actually, leechers don’t bother to upload the data. They just download the torrent and either disable the uploading completely or they limit the upload at very slow speeds. In other words, leechers generally don’t seed the stuff! Yet to find a place that explains the x(y) in all the softwares of which not one single torrent software explains this. Is the value in the () parentheses the total available seeders and the value outside the current number accessed? Seems like that would be the case. But for whatever reason no one explains the parentheses.